Add some Middle Eastern warmth and sensuality to your home with Anya’s exquisite Turkish glassware, which will add a welcoming touch to any space. Lovingly handcrafted with artisanal skills, talent and tradition, Anya’s collections including stunning bowls and platters. Anya’s offerings are functional works of art with intricate designs that are perfect for serving food or just resting on a shelf or a table to be admired. And best of all, no two Anya products are never quite the same. 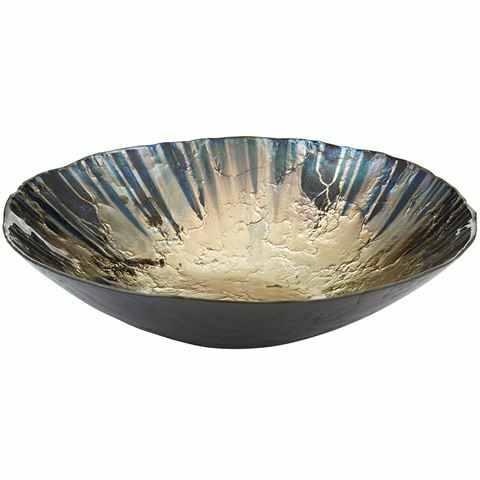 This beautiful Miray bowl has a black and silver foil design which would make even the simplest canapes look exotic. The underside is high shine, dappled black for an extra layer of sophistication. Entrancing black and foil design. Dimensions: 32cm (l) x.4cm (h).